Hacienda San Lorenzo Aké stands on the ancient Mayan ruins called Aké. This was common in the past but it is less common to find them adjacent today. 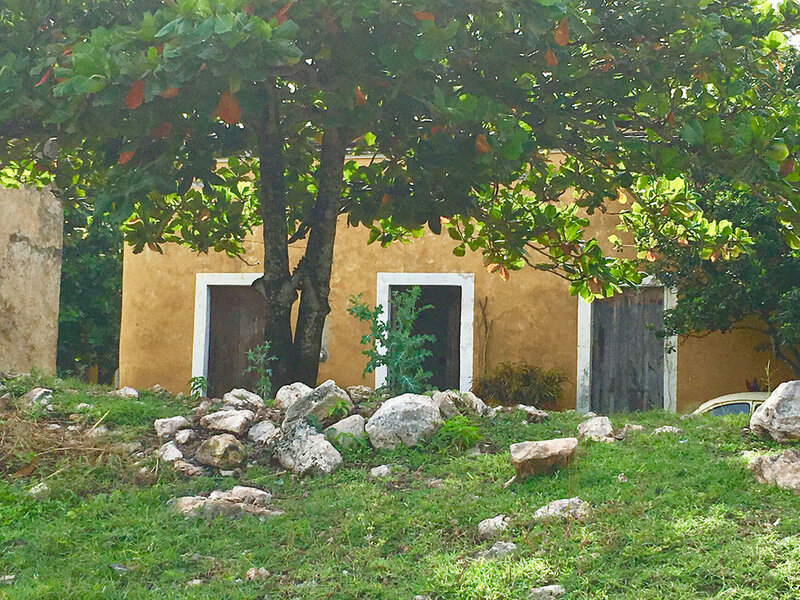 It is a rare working hacienda in Yucatán. The veranda of the main house. Some may argue that this title should be given to beautiful Hacienda Sotuta de Peón (about an hour south of San Lorenzo) but Sotuta produces sisal fibre only for demonstrations to tourists while San Lorenzo actually sell their products; it is a proper factory plantation, even if badly run down. The hacienda story is bittersweet. The Spanish conquerors received land for establishing cattle ranches from the 16th century onwards. This was the land of indigenous people. In Yucatán most of the Spanish military became large landowners after they helped to suppress the revolt of the native Maya against the European-descended population. On their plantations they grew one crop only: henequén, from which they produced sisal fibre and exported it to the whole world. Hacienda owners brought their money into the city of Mérida, using their profits to build the colonial homes (palaces) we are all so fond of on Paseo de Montejo. Mérida became one of the wealthiest cities in Mexico. View of the hacienda from the adjacent Maya ruins of Aké. So what is San Lorenzo's story? The ancient Maya city of Aké was a trading city and was connected to the city of Izamal by a road made of limestone, called sacbé. It was 32km long and from there another road led to the city of Mérida (at the time known by the Maya name of T’ho). So this was a desirable location and Aké played an important role in the conquest of Yucatán, carried out by the Spanish conquistador Francisco de Montejo. Montejo arrived in Yucatán in 1527 with three ships and 400 men. He managed to conquer many Maya towns, but not without encountering a fiery resistance. At Aké, one of the decisive battles took place, where more than 1,000 Maya were killed. Despite this victory, the conquest of Yucatán would be completed only after 20 years, in 1546. John Lloyds Stephens described in his book Incidents of Travel in Yucatan the march of Don Francisco Montejo from the coast. At Aké they found themselves confronted by a great multitude of armed Indians. A desperate battle lasted two days. The Indians lost. Under Spanish rule, the hacienda of San Lorenzo Aké was built literally at the ruin site. The old hacienda dates back to the 1600s. The rural Maya first looked after the livestock of the hacienda owner, and at a later stage the hacienda, owned by the Solis family, processed henequén. The current owner, Andres Solis Rivero, still spends half his working week here and the other part in Mérida. This hacienda still remains in operation despite the years and it also functions as a museum. When we came here with my husband in September 2017, I could see that the place had further potential, for example turning the house into a hotel, as apparently the Event House serves as a wedding venue. 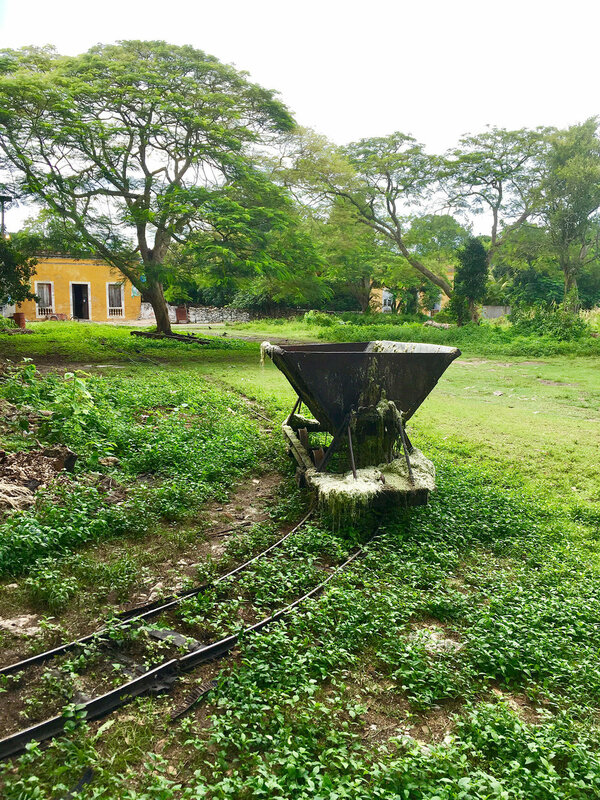 But in essence, it is great that the owner decided to keep the factory going instead, and made the hacienda accessible to visitors. Theodor de Bry, Montejo captures Yucatan in 1527: akg-images.de. To visit, you will have to have a guide, the same applies to the factory. The guide's phone number is painted on the hacienda gate so you can phone him. If Spanish is a problem, you can ask the workers at the factory to call him for you, which is what we did. José Martinez appeared in half an hour, while we visited the ruins of Aké, and charged us 200 pesos per person for the tour. He speaks Spanish only but he also works as the guardian of the hacienda while the owner is in Mérida, so even if you don't understand everything, you do need this guide. José took us inside the factory, while the men were working, to show us a little about the process of processing sisal, from the raw plant until it becomes a fibre. As we came on Saturday at lunchtime, we only managed a few glimpses because the workers were closing down production for the rest of the weekend. Plan accordingly; the best time for a visit is during the week. In any case, we felt as if we were transported to the 19th century, both at the factory and the hacienda itself, as not much has changed since then. Originally this facility was powered by a gigantic ancient diesel engine with two cylinders, now replaced by electric engines. The engine blew up at some point and sent an employee through the roof all the way to the Mayan pyramid. A cross was erected at that pyramid spot to commemorate his death. The two-cylinder diesel engine was reduced to one cylinder and it is still working today. A flat leather belt conveyed the power from the engine up to a second-storey shaft that transmitted henequén leaves via smaller pulleys and converted them to sisal fibre. The shredder, functional until today, is located to the side of the main entrance; another spot holds a mechanical workshop where the maintenance of the shredder is done. Cordelería is the workshop where sisal fibre is made into string, or rather baling twine, rope products and yarns for agricultural use (each having a different thickness). The fibre is further used for sacks for packing products such as coffee, cocoa, corn and other grains that are transported to their respective markets; fabrics for covering walls, carpets, hammocks and other products. A painting inside the hacienda. After the brief factory visit, we proceeded to the hacienda. We entered under a typical colonial arch entrance and then passed the fields where they are still growing some plants. The backdrop of the fields are the columns from the main pyramid of the ruins of Aké, adding the touch of age. On the side of the field there is the old infirmary, the foreman's office (a pretty house, indeed) and the deer-breeding area. You can see the deer from the top of the main pyramid with the columns. The hacienda is also growing chili and lime. The columns of the Maya Palace in Aké ruins at the background. Calabash tree in the main garden. The main square of the hacienda is a pretty garden, with well-maintained lawns and fruit trees. We spotted calabash fruits, called jicaras by the Maya, who make beautiful crafts and bowls from them, avocado and citrus trees and pretty red ginger flowers. The hacienda’s mansion (Casa Principal) sits in the middle of the garden. This is where the owner would stay during his visit. The main house has a beautiful veranda, wooden beam ceilings, tiles with pretty patterns and period furniture. We were not able to see inside the house. The garden of the main house with the church in the background. The guide took us for a jamaica drink (made from hibiscus flowers) and to watch a video to the adjacent Event House (in the past it served perhaps for the guests of the owner). This house had a large room inside and a tall cactus leaning against the orange/yellow walls outside. Talking of which, the houses in the village which are near the hacienda, are also painted yellow, so these houses would have been originally a part of the hacienda, where the workers would have lived. The house of the Mayordomo overseeing the production. José demonstrating to us the quality of sisal fibre. On the side hill there is the Chapel, also yellow, in which to date the inhabitants of the village gather to worship the crucified Christ. We were shown a black Christ by the guide and were told a complicated local story about his discovery in some lagoon or cenote nearby but we did not understand the rest of the story of his possible escape and how the people got him back again to the chapel. Outside the chapel with José. The chapel on the main square. The houses inn the village are painted the same colour as the hacienda. It takes 2 hours and 45 minutes from Playa del Carmen and only 40 minutes from Mérida. Drive along Federal Highway 180, then turn off at the village of Tahmek which leads to the town of Tixkokob. When you arrive at the village of Aké, the site is located on the outskirts of the village. I was unable to find a bus connection to Aké although for sure the village has a bus service from Mérida. If you want to book the guide, you can see the phone number in the photo. The obvious option is to combine a visit to the ruins of Aké with the hacienda visit. Otherwise, you can visit the yellow city of Izamal, only a 40 minute drive to the east, or combine it with a visit to Mérida, the same distance to the west.